Management of the actue and the chronic asthmatic feline patient must be addressed using a multi-modal, anti-inflammatory approach. Feline asthma is an inflammatory condition of the lower airways that manifests clinically as a chronic cough and, in some cases, intermittent exacerbations with expiratory distress. Airway inflammation is typically eosinophilic, but a neutrophilic component can be seen in severely asthmatic patients, particularly if a secondary bacterial infection is present. Eosinophilic airway inflammation is not specific for feline asthma, and during initial diagnostic work-up, other differential diagnoses, including parasitic bronchitis (eg, lungworms, heartworm-associated respiratory disease) should be considered. Bronchoconstriction is a key feature of feline asthma that results in increased airway resistance. This manifests as wheezes on thoracic auscultation and increased respiratory effort most noticeable on exhalation. This may also be accompanied by increased abdominal effort, known as an “abdominal push.” Increased mucus production is also a prominent feature of feline asthma, and this may contribute to airway narrowing and increased respiratory effort. 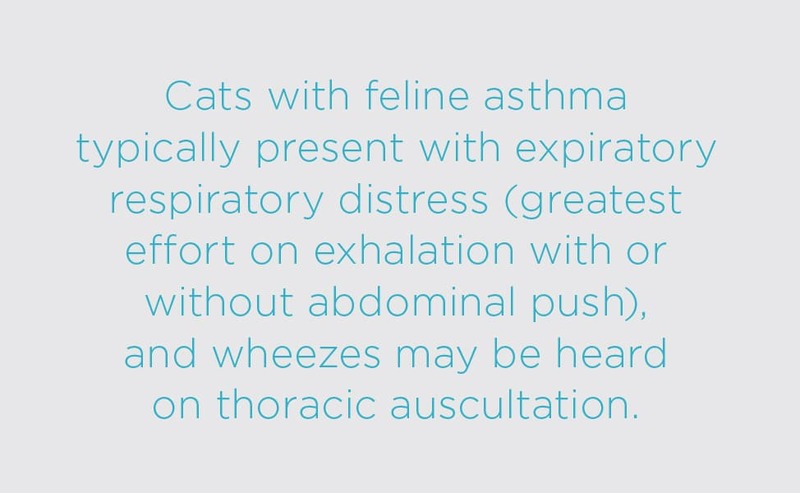 In acute exacerbations, feline asthma can be life-threatening and require emergent management. Acute management is focused on stabilization of the patient as required and addressing bronchoconstriction. Long-term management is aimed at addressing the airway inflammation and is often multimodal. When not addressed appropriately, chronic airway inflammation can lead to airway remodeling, which can further complicate the disease condition and affect prognosis. Therefore, inflammation must be appropriately addressed. This article reviews management of both the acute and the chronic asthmatic feline patient. Asthmatic patients may present in respiratory distress, and these cases require quick and accurate patient assessment. However, complete physical examination may not be possible. Characterization of the respiratory pattern (eg, greatest effort on inspiration vs expiration) combined with abnormalities on thoracic auscultation and an appropriate history can often provide enough information to guide emergent therapy. 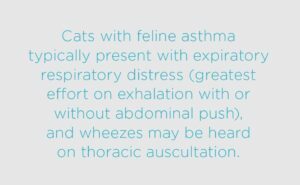 Cats with feline asthma typically present with expiratory respiratory distress (greatest effort on exhalation with or without abdominal push), and wheezes may be heard on thoracic auscultation. Therapy to stabilize patients in respiratory distress should be instituted, and specific therapy to address bronchoconstriction should be considered. These options may vary by patient depending on their stability and tolerability. Mild sedation to relieve anxiety is recommended if there are no contraindications based on history or clinical assessment. Butorphanol can be used with minimal risk, and if additional sedation is necessary, it can be combined with a low dose of a benzodiazepine. FIGURE 1. A metered-dose inhaler attached to an aerosol chamber with a face mask (AeroKat). Acute management also includes home treatment of acute asthma attacks that are not severe enough to warrant emergency presentation to a veterinary facility. Acute exacerbations may result from exposure to asthma triggers. This usually manifests as episodes of spasmodic coughing and increased expiratory effort. At-home care providers should be trained to deliver bronchodilator therapy during episodes involving increased respiratory effort. One option is the use of inhaled albuterol delivered via a metered-dose inhaler with an aerosol chamber attached. However, this works best when cats have been trained to accept the chamber and accompanying mask; some cats will not tolerate the apparatus. Alternatively, owners can be trained to administer a SC terbutaline injection during these events. In addition to managing these events when they occur, clients must know to contact their veterinarian when asthmatic cats experience these events regularly or the frequency of these events increases. This can indicate that the disease is poorly controlled and that long-term management must be adjusted, or that a secondary or concurrent condition must be addressed. The main goals of long-term management include reducing airway inflammation and airway resistance. Although many therapies have been investigated, the mainstays for accomplishing these goals remain glucocorticoids and bronchodilators. This section discusses therapeutic mainstays as well as therapies that have shown promise in experimental models of feline allergic asthma. 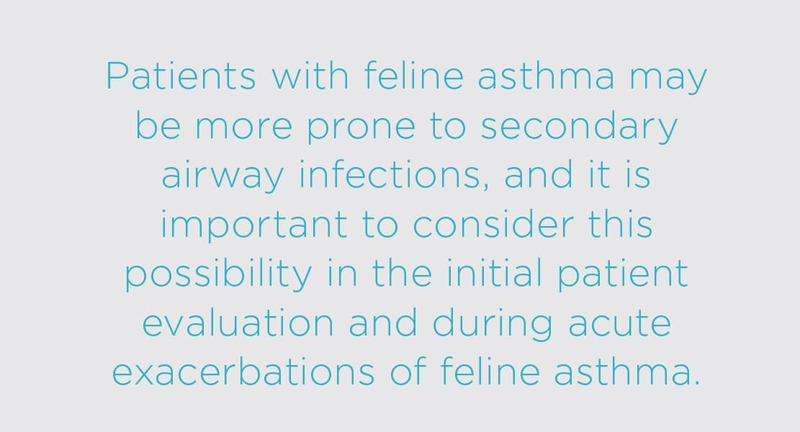 Addressing airway inflammation is an essential component of therapy in feline allergic asthma. Glucocorticoids are the first-line therapy to accomplish this and are potent anti-inflammatory agents. Oral glucocorticoids, such as prednisolone, are widely available and inexpensive, which makes them an ideal first choice for many patients. Results of studies that used prednisone (2 mg/kg q24h) in cats with experimentally induced allergic asthma indicate that oral glucocorticoids reduce eosinophilic airway inflammation.4,5 However, a retrospective study evaluating high-dose oral steroid therapy (prednisone/prednisolone, 2 mg/kg q24h ) in cats with naturally occurring chronic lower airway disease indicated that clinical signs may resolve in some cats while airway inflammation persists.6 Persistent inflammation is clinically relevant because it can lead to airway remodeling. Unfortunately, without repeating airway sampling (eg, bronchoalveolar lavage), there is no way to identify patients with persistent inflammation, and repeat sampling is not clinically feasible in most cases. Therefore, this simply needs to be considered in therapeutic decision-making. 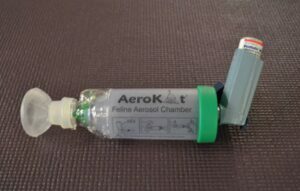 Another method for administering glucocorticoids to feline patients is via a metered-dose inhaler with an attached aerosol chamber and face mask, as mentioned earlier. Inhaled glucocorticoids are an attractive option for cats that will not tolerate administration of oral medication. With appropriate training with the aerosol chamber and mask, most cats tolerate the device quite well. Additionally, cats with concurrent medical conditions for which systemic steroids are undesirable (eg, diabetes mellitus) and cats requiring long-term steroid administration may benefit from inhaled glucocorticoid therapy. Finally, the successful use of cyclosporine for the management of feline asthma was reported in a single case report in which glucocorticoids were contraindicated because of concurrent diabetes mellitus and severe heart disease.9 Treatment with cyclosporine in this case resolved clinical signs and airway inflammation.9 Although further study is needed with this therapy, it may be a useful alternative in complex cases in which steroids are contraindicated. When evidence of airflow limitation exists historically, on physical examination, or on diagnostic testing, bronchodilators should be considered as a component of therapy. They should not be used as a stand-alone therapy because they do not address airway inflammation, which is the driving force behind the asthmatic process and bronchoconstriction. Therefore, using them in combination with anti-inflammatory therapy discussed above is necessary. Several categories and types of bronchodilators are available, including short-acting β2 agonists, long-acting β2 agonists, methylxanthines, and anticholinergics. Numerous options are commercially available, but this article covers those commonly used or investigated in veterinary medicine. Short-acting β2 agonists include albuterol (also known as salbutamol), levalbuterol, and terbutaline. The metered-dose inhalant form of albuterol is a rescue bronchodilator, commonly used to manage acute bronchoconstriction episodes (TABLE 1). Although inhalant albuterol is useful in acute episodes, it should not be used as a long-term therapy. Inhalant albuterol is composed of 2 enantiomers: the R-enantiomer and S-enantiomer. The R-enantiomer is responsible for the bronchodilatory effects of albuterol, and the S-enantiomer was long thought to be inert. However, long-term administration of the S-enantiomer promoted airway inflammation and bronchospasm in an experimental model of feline asthma.10 Long-term overuse of inhaled albuterol in humans with asthma is also associated with increased risk for death.11 For these reasons, inhaled albuterol should be limited to management of acute bronchoconstriction, and owners should be cautioned regarding overuse. Levalbuterol is a form of R-enantiomer albuterol. This may be an option for longer-term use in patients requiring such therapy. Terbutaline, which is available in both an injectable and an oral form, is another option for bronchodilators in this class. Injectable terbutaline was discussed as a rescue therapy in the previous section on emergent management. 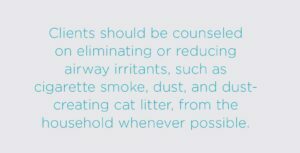 As an injectable medication with quick onset of action, it can rapidly relieve bronchoconstriction and avoid the potential stresses of using an inhaled medication (eg, a cat not trained to accept a face mask). Long-acting β2 agonists are available in inhalant forms but are most widely available in combination with a steroid. These medications are less commonly used in the management of feline asthma. However, salmeterol, alone or in combination with fluticasone propionate, has been evaluated in an experimental model of feline asthma. Although a study evaluating salmeterol alone showed no improvement in measures of airway resistance or airway inflammation, the combination of salmeterol with fluticasone propionate did reduce airway inflammation beyond treatment with fluticasone alone.5,12 It was suggested that bronchodilation from salmeterol may have promoted better deposition of fluticasone within the airways. These studies evaluated very brief drug administration (4 days); therefore, it is difficult to assess effects seen with longer-term use. Methylxanthines, such as theophylline and aminophylline, are most commonly administered as oral medications in the treatment of feline asthma (TABLE 1). Pharmacokinetics studies have shown that extended-release theophylline administered to cats q24h achieves therapeutic plasma concentrations.13,14 A follow-up study determined that plasma theophylline concentrations were highest after evening dosing.15 An ex vivo study documented efficacy of theophylline at producing bronchial relaxation, but the agent was less efficacious than other bronchodilators evaluated.16 How this finding extrapolates to clinical patients is uncertain, particularly with long-term administration. 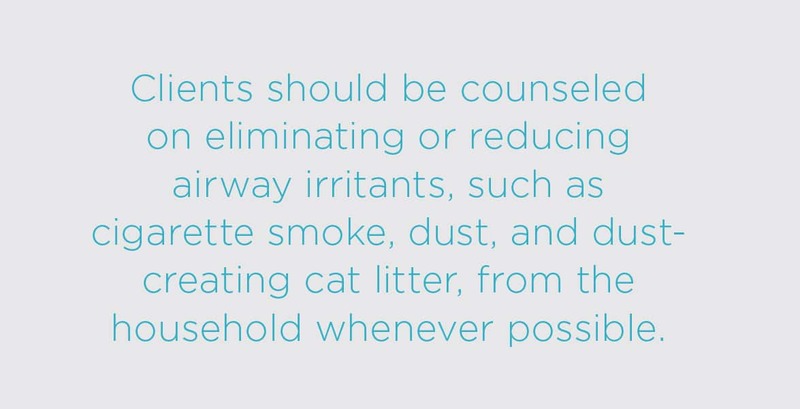 Clients should be counseled on eliminating or reducing airway irritants, such as cigarette smoke, dust, and dust-creating cat litter, from the household whenever possible. Additionally, it is important to ensure that cats are receiving adequate parasite control—heartworm and other parasite exposure can also induce lung disease, as briefly mentioned above. 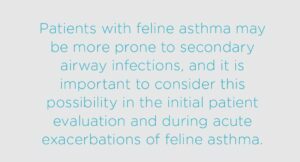 Finally, patients with feline asthma may be more prone to secondary airway infections, and it is important to consider this possibility in the initial patient evaluation and during acute exacerbations of feline asthma. When airway samples are collected as part of the diagnostic workup, appropriate airway cultures should be submitted to evaluate for this possibility. Many therapies have been investigated in feline experimental models, and this section briefly describes pertinent therapies that have demonstrated some efficacy and/or are promising future therapies. Supplementation with a long-chain omega-3 polyunsaturated fatty acid (PUFA) and antioxidant (luteolin) combination resulted in decreased airway hyper-responsiveness in cats with experimentally induced allergy.18 However, airway inflammation did not significantly decrease. Therefore, supplementation may have some clinical benefit, and this could potentially be used as an adjunctive to mainstay therapy. Further research is needed to determine whether these effects apply to other omega-3 PUFA supplements and, in particular, whether there is an effect in patients with naturally occurring asthma. Allergic asthma in human medicine is often managed by identifying allergens to which individuals are sensitized, avoiding the allergens (when possible), and/or immunotherapy. Identification of allergens to which a cat is sensitized can be challenging. Although intradermal skin testing (IDST) is possible in cats, interpretation of the results is difficult. Evaluation of allergen-specific IgE concentrations is another option for allergy testing that requires only a blood sample. In a study evaluating IDST and serum allergen-specific IgE testing in cats, both IDST and an FcεR1α-based enzyme-linked immunosorbent assay (ELISA) were specific enough for selection of allergens for immunotherapy.19 A separate ELISA (enzymoimmunometric assay) evaluated in this study was unreliable;19 therefore, reliability of available ELISAs for detection of serum allergen-specific IgE may vary. Once allergens are identified, avoidance of allergens can be considered. However, this is unlikely to be successful in feline patients. A feline experimental allergic model evaluated allergen-specific immunotherapy. Several studies conducted expedited immunotherapy (“rush” immunotherapy) using various protocols and found it reduced eosinophilic airway inflammation.20,21 Although this therapy appears to be effective in the experimental model, data in clinical patients are lacking. Future studies in clinical patients are needed to determine clinical usefulness. In studies evaluating the efficacy of mesenchymal stem cell (MSC) therapy for feline allergic asthma, potential benefits appear to be primarily directed at reduction of airway remodeling. Airway remodeling is a consequence of long-standing airway inflammation, and although MSC therapy did not result in decreased eosinophilic inflammation or airway hyper-responsiveness, positive effects on computed tomography indices were noted. Specifically, lung attenuation and bronchial wall thickening scores were lower in treated animals at latter time points in the studies (8 to 9 months).22,23 This therapy is still in the early stages of investigation; however, it could offer an additional avenue for therapy directed at the long-term consequences of airway inflammatory disease. Feline allergic asthma is an inflammatory airway condition that results in eosinophilic airway inflammation and bronchoconstriction. Therapy is often multimodal. Airway inflammation must be addressed with anti-inflammatory therapy. At present, glucocorticoids are the mainstay of anti-inflammatory therapy. Bronchodilators may also be required in cases that demonstrate evidence of bronchoconstriction, including increased expiratory respiratory effort, wheezing, and/or episodes of expiratory respiratory distress. New treatments are being sought for management of feline allergic asthma, and some have shown promise in experimental models. Additional work remains for translating these potential therapies into clinical practice. Tseng LW, Drobatz K J. Oxygen supplementation and humidification. In: King LG, ed. Textbook of Respiratory Disease in Dogs and Cats. St. Louis, MO: Saunders; 2004: 205-213. Mazzaferro EM. Oxygen therapy. In: Silverstein D, Hopper K, eds. Small Animal Critical Care Medicine, 2nd ed. St. Louis, MO: Saunders; 2015:77–80. Plumb DC. Plumb’s Veterinary Drug Handbook, 8th ed. Hoboken, NJ: Wiley Blackwell; 2015. Reinero CR, Decile KC, Byerly JR, et al. Effects of drug treatment on inflammation and hyperreactivity of airways and on immune variables in cats with experimentally induced asthma. Am J Vet Res 2005;66(7):1121-1127. Leemans J, Kirschvink N, Bernaerts F, et al. Salmeterol or doxycycline do not inhibit acute bronchospasm and airway inflammation in cats with experimentally-induced asthma. Vet J 2012;192(1):49-56. Cocayne CG, Reinero CR, DeClue AE. Subclinical airway inflammation despite high-dose oral corticosteroid therapy in cats with lower airway disease. J Feline Med Surg. 2011;13(8):558-563. Cohn LA, DeClue AE, Cohen RL, Reinero CR. Effects of fluticasone propionate dosage in an experimental model of feline asthma. J Feline Med Surg 2010;12(2):91-96. Galler A, Shibly S, Bilek A, Hirt RA. Inhaled budesonide therapy in cats with naturally occurring chronic bronchial disease (feline asthma and chronic bronchitis). J Small Anim Pract 2013;54(10):531-536. Nafe LA, Leach SB. Treatment of feline asthma with ciclosporin in a cat with diabetes mellitus and congestive heart failure. J Feline Med Surg 2015;17(12):1073-1076. Reinero CR, Delgado C, Spinka C, DeClue AE, Dhand R. Enantiomer-specific effects of albuterol on airway inflammation in healthy and asthmatic cats. Int Arch Allergy Immunol 2009;150(1):43-50. Spitzer WO, Suissa S, Ernst P, et al. The use of beta-agonists and the risk of death and near death from asthma. N Engl J Med 1992;326(8):501-506. Leemans J, Kirschvink N, Clercx C, Snaps F, Gustin P. Effect of short-term oral and inhaled corticosteroids on airway inflammation and responsiveness in a feline acute asthma model. Vet J 2012;192(1):41-48. Dye JA, McKiernan BC, Jones SD, Neff-Davis CA, Koritz GD. Sustained-release theophylline pharmacokinetics in the cat. J Vet Pharmacol Ther 1989;12(2):133-140. Guenther-Yenke CL, McKiernan BC, Papich MG, Powell E. Pharmacokinetics of an extended-release theophylline product in cats. JAVMA 2007;231(6):900-906. Dye JA, McKiernan BC, Neff-Davis CA, Koritz GD. Chronopharmacokinetics of theophylline in the cat. J Vet Pharmacol Ther 1990;13(3):278-286. Leemans J, Kirschvink N, Gustin P. A comparison of in vitro relaxant responses to ipratropium bromide, beta-adrenoceptor agonists and theophylline in feline bronchial smooth muscle. Vet J 2012;193(1):228-233. Leemans J, Kirschvink N, Clercx C, Cambier C, Gustin P. Functional response to inhaled salbutamol and/or ipratropium bromide in Ascaris suum-sensitised cats with allergen-induced bronchospasms. Vet J 2010;186(1):76-83. Leemans J, Cambier C, Chandler T, et al. Prophylactic effects of omega-3 polyunsaturated fatty acids and luteolin on airway hyperresponsiveness and inflammation in cats with experimentally-induced asthma. Vet J 2010;184:111-114. Lee-Fowler TM, Cohn LA, DeClue AE, Spinka CM, Ellebracht RD, Reinero CR. Comparison of intradermal skin testing (IDST) and serum allergen-specific IgE determination in an experimental model of feline asthma. Vet Immunol Immunopathol 2009;132(1):46-52. Reinero CR, Byerly JR, Berghaus RD, et al. Rush immunotherapy in an experimental model of feline allergic asthma. Vet Immunol Immunopathol 2006;110(1-2):141-153. Lee-Fowler TM, Cohn LA, DeClue AE, Spinka CM, Reinero CR. Evaluation of subcutaneous versus mucosal (intranasal) allergen-specific rush immunotherapy in experimental feline asthma. Vet Immunol Immunopathol 2009;129(1-2):49-56. Trzil JE, Masseau I, Webb TL, et al. Long-term evaluation of mesenchymal stem cell therapy in a feline model of chronic allergic asthma. Clin Exp Allergy 2014;44(12):1546-1557. Trzil JE, Masseau I, Webb TL, et al. Intravenous adipose-derived mesenchymal stem cell therapy for the treatment of feline asthma: a pilot study. J Feline Med Surg. 2016;18(12):981-990. Morgan RV. Small Animal Drug Handbook, 5th ed. St. Louis, MO: Saunders Elsevier; 2011. Tekla Lee-Fowler, DVM, MS, DACVIM, is an assistant professor of small animal internal medicine at Auburn University College of Veterinary Medicine. Her primary area of interest is airway disease of small animals with a research focus of feline lower airway disease. She has authored several book chapters and numerous research articles related to these topics. Dr. Lee-Fowler earned her DVM in 2005 from Mississippi State University. She completed a small animal internal medicine residency at the University of Missouri and attained diplomate status in 2009.